A wet and windy but milder day than of late at Grosmont on Wednesday, with Ian Pearson, Steve Hyman, Derek Shorten, Dave Donegan and, eventually, for the late morning only, myself. The day started with the usual cuppa, after going to the Co-op to get some tea bags, then the stove was lit and the pots washed by Derek (whose special mug had been broken since our last attendance:'(). 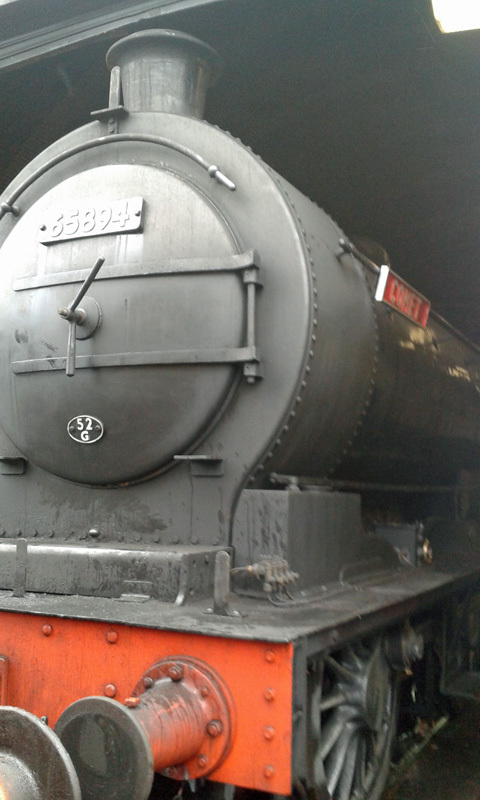 The Q6 was on steam test, with the shed fitters getting ready for this coming weekend's Santas and Dining trains. The Santa locomotives have all been temporarily named after reindeer - the Q6 is now Prancer and the J27 Comet (see photos). 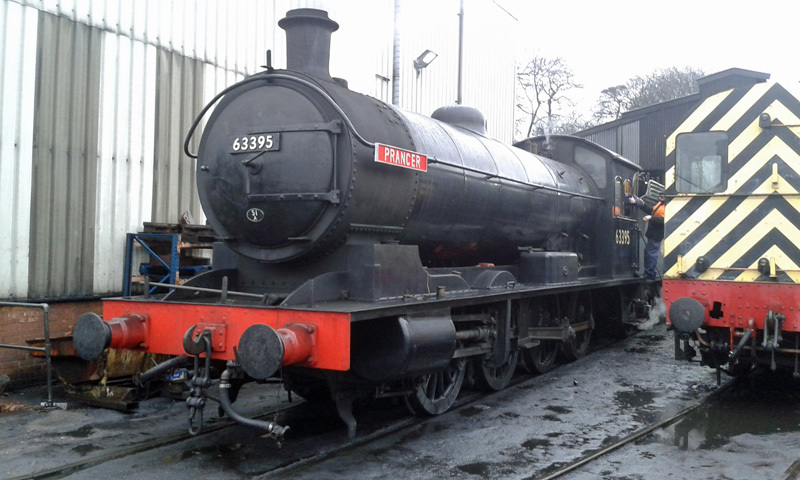 5428 Eric Treacy has been re-named Rudolph and is rumoured will also be fitted with a red nose. Ian helped the fitters out by moving the Q6 onto the pit so they could continue with their checks on the locomotive. This gave Ian and Steve the opportunity to oil up the tops of the leading, intermediate, and driving axle boxes which feed oil to the horn blocks - not a very pleasant job. Dave siphoned all the brass lubrication boxes which were contaminated with water, and replenished them with fresh oil, along with the slide bar lubricators which had the trimmings renewed. A new trimming was also made for the left hand brass box that feeds the valve spindle on that side. The Q6 passed its steam exam and is ready for the weekend. The fire was disposed, and Ian moved the engine back to the shed outside No 4 Road. Lunch was had on the bench in Deviation Shed. As it was mild it would have been too hot to sit round the fire! In the short time I was present, I managed to carry out the monthly check on the defibrillator. The J27 just about finished its washout, prior going onto the wheel drops for the L/H broken driving spring to be changed. This was completed during the afternoon and it was due to have its steam test yesterday. The safety valves on the J27 have been cleaned and refitted, but it was reported that they are in very poor condition and will need replacing in the New Year. Discussions are under way with the MPD about the best way of achieving this. Barney is also going to order some new safety valve springs for the Q6.